Recognised efficacy against lead poisoning. Removes calcium deposits from the cornea, improving vision. 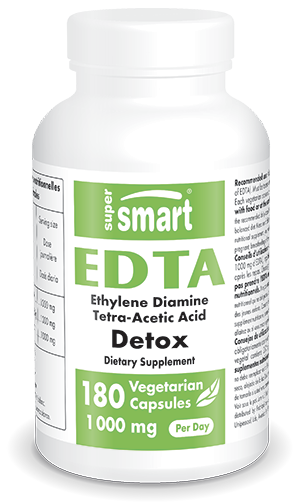 Ethylene diamine tetra-acetic acid (EDTA) removes lead and heavy metals from the body by bonding to them through chelation', and carrying them away naturally in waste. EDTA is also an excellent chelator of calcium which accumulates in vascular walls increasingly as we age, causing hardening of the arteries and atherosclerotic plaques which obstruct blood flow. EDTA's systemic action benefits not just the heart but all vessels and organs. In addition, it is a powerful antioxidant, especially effective at reducing lipid peroxidation - a major cause of atherosclerosis. Is a safe, effective, inexpensive and more practical method than intravenous chelation of obtaining all the benefits of a regular dose of EDTA. Supports normal endothelial function in the miles upon miles of vessels and capillaries in the human body by stimulating nitric oxide production which is essential to cardiovascular health. Nitric oxide relaxes blood vessel and capillary walls so that they expand to their optimum point. Prevents oxidative stress by chelating heavy metals and toxins in blood flow even before they produce oxidative reactions. Lowers serum cholesterol levels often by 20% or more in just a few weeks, and helps normalise blood pressure. Reduces the risk of heart attack by preventing the formation of clots. Prevents and relieves thoracic pain and cramps in lower limbs. Reduces fatigue, increases energy and improves mental clarity by lessening the toxic load on the body and by generally improving circulation. To obtain the benefits of oral chelation therapy, you may also be interested in other oral chelators similar to EDTA. DMSA (dimercaptosuccinic acid), for example, is recognised as a powerful mercury chelator. Though less well-known than EDTA and DMSA, zeolite clinoptilolite is a natural and versatile chelator of many heavy metals including lead, cadmium, mercury and nickel. For an optimal detox, the supplement Humic & Fulvic Acids may also be of interest. Its composition is based on texts from Ayurveda, the traditional Indian system of medicine.
. I recommend routine consumption of oral chelators every day for the rest of your life, from the day you're old enough to swallow a supplement”. Each vegetarian capsule contains 250 mg ethylene diamine tetra-acetic acid (EDTA). Take 2 capsules twice a day (that's 1 gram of EDTA), or more as advised by your therapist, always on an empty stomach, 1 hour before, or two hours after a meal. Important: EDTA can also chelate certain essential minerals and must not therefore be taken at mealtimes or with other nutritional supplements.